Since joining the JCU faculty in 2011, Dr. Ehrhardt has taught a wide range of courses on the ancient world including Greek and Latin language courses at all levels, courses in Greek and Roman history, Greek archaeology, mythology, and race/ethnicity in the ancient Mediterranean world. Dr. Ehrhardt particularly enjoys incorporating role-playing pedagogies in her classes, allowing students to enact historical moments from epic sea voyages to the trial of Socrates. She was the 2018 recipient of the Lucrezia Culicchia Award for Teaching Excellence in the College of Arts and Sciences. Dr. Ehrhardt’s research centers on the connections between ancient poetry and the cultures in which it was produced, performed, and received. 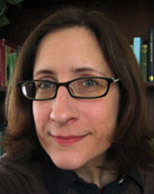 Her current research includes articles on Roman satire, Horace’s Odes, and archaic Greek poetry. MTR 3:30 - 5:00. Drop-ins welcome. Other times available by appointment! Email me at kehrhardt@jcu.edu to set one up.